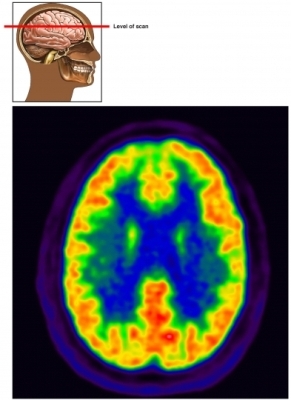 Positron emission tomography (PET) scans make pictures that show activity in body tissues. Computed tomography (CT) scan uses a computer to take many x-rays of the body. A PET/CT scan is a test that combines PET and CT scans to take pictures of the body. PET/CT scans can be done on any part of the body. PET/CT scans give us details about the structure of a body part and how it is working. Show a tumor and the function of the cells that make up the tumor. This can help tell cancerous and noncancerous growths apart. Brain, endocrine, and heart disorders are also studied using PET/CT scans. Bring a list of the medicines you take to the test. If you have diabetes, ask your doctor if you should take your medicine before the test. An abnormal blood glucose level may cause problems with the test results. Let your doctor know if you have kidney problems. The doctor may need to take steps to keep your kidneys safe during the test. If you are breastfeeding, talk to your doctor before you go for your test. Your doctor may tell you to pump breast milk to use until the contrast materials leave your body. If you are worried about being in small spaces, you may be given a medicine to help you relax. An IV will be placed in your arm. A small amount of the tracer substance (used for the PET part of the scan) will be injected through the IV. In some cases, the tracer substance will be breathed in or swallowed instead. You will wait about 60 minutes after this injection. You will be positioned on a table. More contrast material (used for the CT part of the scan) will be given. The table will move slowly through a doughnut-shaped ring. You will need to lie still for about 35 minutes while the pictures are taken. You should drink extra water throughout the day after your scan. This helps to flush the tracer materials from your body. If you had medicine to help you relax, you will need to have someone drive you home. You can expect to return to your normal activities the same day as your test. The scan takes about 2 hours. The injection is given about an hour before the scan. The scan itself takes about 35 minutes. You may have discomfort when the IV is put in. There should be no other pain. You may feel some flushing when the tracer material is injected. Based on the results, your doctor will decide if more tests or treatments are needed. PET/CT scan. UPMC website. Available at: http://www.upmc.com/patients-visitors/education/tests/Pages/petct-scan.aspx. Accessed March 14, 2018. Positron emission tomography-computed tomography (PET/CT). Radiological Society of North America Radiology Info website. Available at: https://www.radiologyinfo.org/en/info.cfm?pg=pet. Updated January 23, 2017. Accessed March 14, 2018. Schidt GP, Kramer H, Reiser MF, Glaser C. Whole-body magnetic resonance imaging and positron-emission tomography-computed tomography in oncology. Top Magn Reson Imaging. 2007;18(3):193-202.